Melt in the mouth vanilla custard biscuits – just like Granny used to make! These cute little golden tinged biscuits may look pretty unassuming but they are absolutely wonderful in their simplicity. They are also known as melting moments, but I still call them by the name my Granny gave them – custard biscuits. If you’re gentle with the dough and don’t overmix, you’ll be rewarded with biscuits that melt in your mouth. If you wanted to make these biscuits a little more special (and cute!) 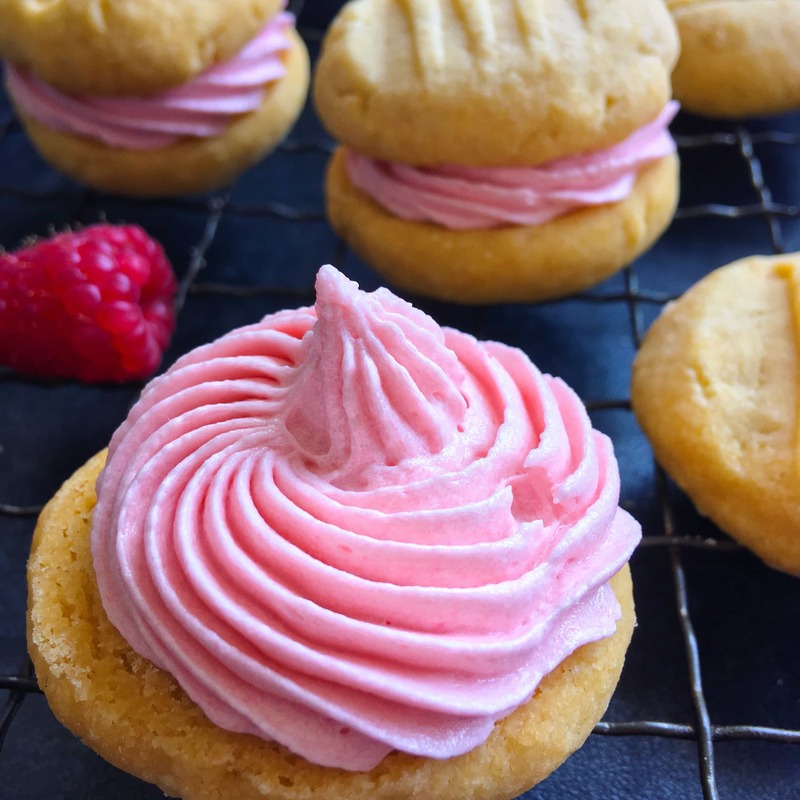 you could make some fresh raspberry vanilla buttercream to sandwich them together. Just cream together 100g soft butter, 200g icing sugar (confectioners sugar) and 1/2 teaspoon of vanilla extract until light and fluffy. Purée 50g fresh raspberries, then press through a sieve to remove the seeds. Add the fresh raspberry juice to the butter/icing sugar and mix well until smooth. 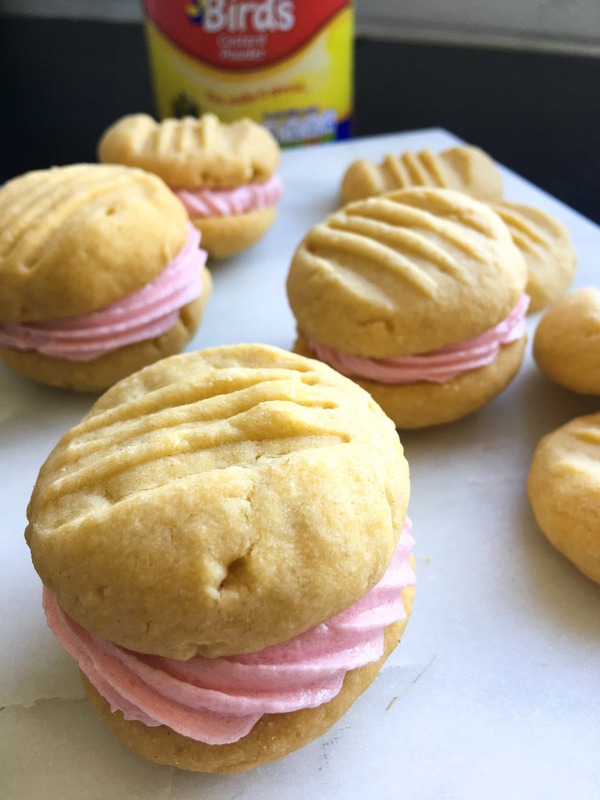 Place the buttercream in a piping bag fitted with a star nozzle and sandwich the biscuits together with swirls of buttercream. Looking for more biscuit and cookie recipes? I also linked up at A Mummy Too for recipe of the week. Soft, melt in your mouth vanilla custard biscuits. Just like Granny used to make! Roll the mixture into balls and place on the baking tray, press them down with a fork. Bake for 12-15 minutes or until golden. Leave on the baking tray for a few minutes before removing to a wire rack. These look just lovely. I don’t know if I’ve ever heard of custard powder, but I think I can imagine what they must taste like! Thanks Frugal. They are very tender and you can definitely taste the custard flavour. Made these this afternoon. So easy and very tasty. Will be great bagged up for school table sales etc. Might try adding in some grated lemon or lime zest, for a bit of zing! I’ve never tried it so can’t guarantee it, but I don’t see why not! ? This recipe is very similar to one of our favourites only we join them together with a buttercream with a touch of lemon juice. Very nice. Sounds lovely ? Funnily enough I’m making these right now! Thank you!